Welcome to Swell Vision Center! We are a 100% independent full-service optometry practice located in the Villages at Brunswick Forest! We house a large selection of only the finest eyewear. Every piece has been hand selected by us to ensure you’ll love what you wear! With ocular health being of the upmost importance, we are equipped with state-of-the-art diagnostic equipment to diagnose, treat, and manage ocular diseases. Dr. Craig Scibal was born and raised in eastern NC and is very excited for the opportunity to provide the people of Leland/Wilmington an unforgettable eye care experience! Welcome to Swell Vision Center! 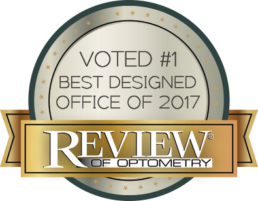 We are a 100% independent full-service optometric practice and optical boutique located in the Villages at Brunswick Forest! At Swell Vision, we understand the importance of eye health and are equipped with state-of-the-art equipment to carefully examine your entire visual system from front to back! Swell Vision Center is a finalist in two local publications! Please Vote for us today! We offer a large selection of beautiful and unique handcrafted eyeglass frames and lenses. We’re proud to say that each frame in our showroom has been hand picked and inspected to insure only the finest products. We are honored to have won this year’s Office Design award by Review of Optometry. Judges were impressed by the exposed brick, concrete floors, and natural wood accents that “invite the patient with comfort.” Setup an appointment today! We’ll have your desired music playing and refreshments ready when you arrive. I looked everywhere from Wilmington to Raleigh to Asheville and this is the best doctor, staff, frame selection and quality glasses. Nobody compares to the quality and fit of their glasses and contacts. I will never go anywhere else for all my eye care. I am thankful to have found this quality of eye care this close to Wilmington. I love my new glasses. Dr. Scibal is the best! We won’t go anywhere else. He is so fun and but also very professional. The atmosphere at Swell can’t be beat. You definitely don’t feel like you are at the eye doctor. He is wonderful with adults and especially wonderful with kids. This was my first appointment at Swell Vision Center. I was greeted immediately when I arrived and they even offered me something to drink! They have a very friendly dog in the office, Horatio, who also greeted me. Dr. Scibal did a very thorough exam and explained everything he was doing, which was very refreshing. Then when it was time to pick out glasses, the optician was very helpful and helped me find the perfect frames! The office is beautiful and very welcoming. I’m a patient for life!